I promised a Devils Lake Walleye Report after my perch report yesterday. I feel bad that some folks were giving us a hard time for keeping some of those perch. Some we kept because they wouldn’t have survived coming up from deeper water. To be very honest with everyone I hardly keep fish for myself throughout a season. Perch are by far my favorite to eat, so for us keeping a few 8 to 10 inch perch that otherwise would not make it I’m not going to apologize for. When we ate a pile of them Saturday night I didn’t feel bad. I just kept on looking for the perfect bite, and I’m pretty sure I had lots of them. Now on to the nuts and bolts of this Walleye Fishing Report. Of course both the early morning and late evening were the best! Now, before you go saying I’m only telling you this because I’m sponsored by Lindy. I have to tell you we used the new “Lindy Glow Spoons” this weekend and holy moly did they perform well! We found them to work extremely well early and later for obvious reasons. One trick we figured out was after the glow stick is in the cold water for a bit, they begin to lose their brightness. So we simply put them in our hands blew hot air on them and they instantly regained their glow. 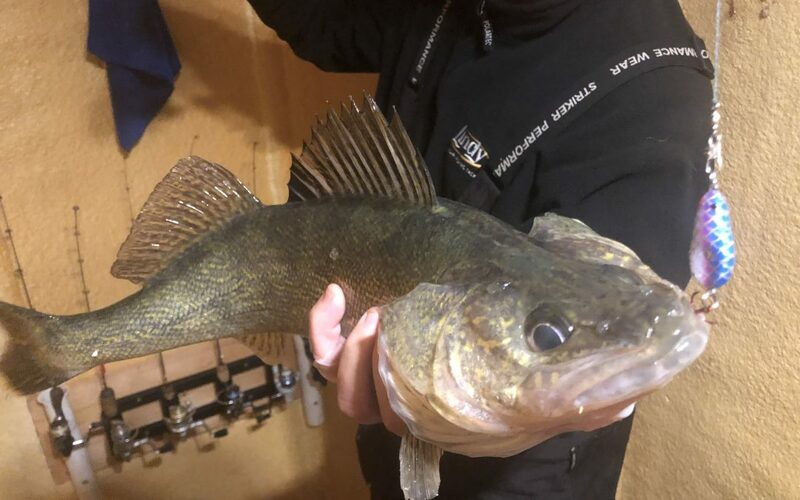 Most walleyes were caught on any type of push up out on the lake. We caught them on all of the bumps we fished! As shallow as 8 and as deep as 23 we caught them this past weekend. We caught and released a handful of fish between 22 to 26 inches as well. The walleyes were pretty aggressive cruising in to check out our Lindy Glow Spoons and a few jiggles and BAM! Fish on! Just something about that aggressive strike that keeps us coming back for more! Also, if your looking to do some spearing or what I refer as bow hunting on ice I’ll be setting shacks very very soon! This is an affordable way to spend the day watching underwater TV. Please email me or text me to book your spearing adventure on Sakakawea! 701-471-8649 or email me at mikepelusooutdoors@gmail. I will also have another ice fishing report for some other lakes coming soon!